My brother grabbed his guitar case that was sitting in the corner of our basement rec room – right next to his Champ Amp. With vast pride, he took out his baby blue Fender Mustang, propped the guitar onto his shoulder; sneaking a peek in the mirror while plugging in his amp. Raised on a farm in rural Memphis and Arkansas, Wells was inspired by the productive blues culture. He learned harmonica from Little Junior Parker… After his parents separated, Junior and his mother eventually moved to Chicago in 1946. It was here where Junior discovered his future. In his teens Wells often played hooky from school; finding whatever time he could to practice his craft. He would sneak into clubs, vying to “sit-in” with bands… One classic story is where Junior convinced his sister and her boyfriend at the time (a Chicago policeman) to take him to Sam’s Ebony Lounge to see Muddy Waters band. When Little Walter left Muddy Waters band in 1952, Junior got the call. He stayed with Waters until he was inducted into the army. However, he would go AWOL and create some of his first recordings during that time. In 1957, Wells hooked up with producer Mel London, who owned the Chief, Profile and several other record labels. The association resulted in many of Wells’ most memorable songs, including “I Could Cry” and “Lovey Dovey Lovely One” in 1957 and the R&B influenced classic (and one of my personal favorites) “Messin’ with the Kid” in 1960. 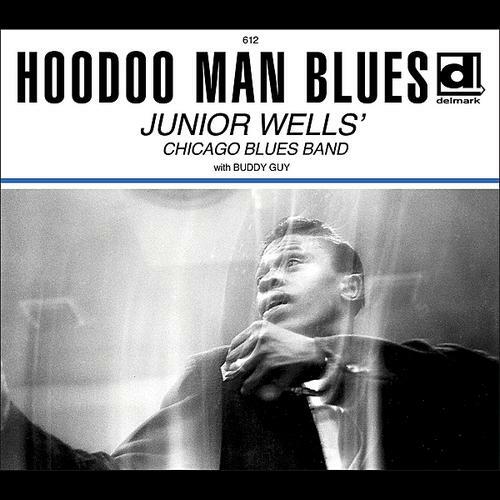 Junior was best known for his 1965 debut album Hoodoo Man Blues on Delmark Records featuring Buddy Guy on guitar. The album emulated the smoky atmosphere of the era’s Westside Chicago blues bars. It made an impression on many people. For me, Hoodoo Man Blues will always remind me of some the first audible sounds that I recall. As time progressed into the mid-seventies, and after opening for the Rolling Stones with Buddy Guy in that time frame, little was heard of Wells on vinyl. He did however continue to have mass appeal at home and abroad throughout his career. In 1997 on his album entitled Come on in This House, the critics took notice once again. It would seem that Junior was on the comeback. The album even won the W.C. Handy Blues Award ( known now as The Blues Music Awards) for Traditional Blues Album. Wells remained a powerful live performer. With one mesmerizing blast from his amplified harmonica, he would gain the respect of everyone in the room. Junior continued to perform until he was diagnosed with lymphatic cancer in the summer of 1997. That fall, while undergoing treatment, he suffered a stroke; sending him into a coma. Wells passed away in January 1998. There was always these cool musical moments that took place in my household. Eventually my brother added his friends to the practice sessions. Soon he really got his chops down, and this lead to some serious rehearsals in our basement on the weekends. As a result, my interest in music grew watching everyone rehearse. Often there were audible music wars in the house as The Monkees, The Beatles and Paul Revere & The Raiders were blasting from my sister’s bedroom. But to me, even though I was so young, it was the blues that truly stuck in my mind. It seem to come from somewhere deeper inside. I love performers that are totally in control — control the band and control the audience. Junior Wells was definitely in control of all aspects of his music. Junior Wells just doesn’t get his “props.” It’s great to see a piece – of some length – that gives him his due as one of the premier bluesmen. 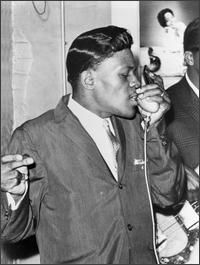 Junior Wells is on my list of all time greatest blues harmonica players. He is missed, love his music! I really enjoyed your post. The juxtaposition of Junior’s bio with your family story was great. I grew up with some of the same music, and my late husband loved to play along to the blues. Clapton was his idol, but he revered all the greats and you made me think of him with a smile. And to everyone else so far, your comments are most appreciated. Thanks… Junior is on my list of all time favorites as well. I also love the fact that many people unfamiliar with Junior Wells are reading this… Cool stuff indeed! “Messin with the Kid” is one of my husband’s band’s favorite covers. So is Hoodoo Man. I’d only listened to covers before and it’s nothing compared to the real thing. That harp is sweet! Great voice too. Thanks BB. The Blues Blogger does it again. Thanks brother for the memories. I remember every song you have posted in this article. No one, and I mean no one could turn it on like Junior Wells in his,” Got MY Mojo Working.” I believe that every time Mr Wells done a performance, it was much more than just a performance, it was a spiritual experience in his mind and heart and his fans could easily catch that selfsame spirit. Thanks again Blues Blogger for your hard work and dedication toward the memory of some of the greatest blues and jazz performers that ever took the stage. I love the Hoodoo Man Blues album, in particular the title song and “Early In The Morning.” I have a interesting story connected to the album. Back in the ’90s when the national book stores had a well stocked cd/dvd department, there was one that was a half hour drive away that seemed to have a better blues selection than the other locations near by. I often wonder if the person responsible for stocking this department liked the blues. This one particular time that I was there, I noticed a younger guy checking out the blues section. I couldn’t mind my own business. I noticed him pick up the “Hoodoo Man Blues” cd. He turned it over and read the songs. I thought to myself, if he’s on the fence about purchasing the cd, maybe a recommendation by a local blues afficionado would help him make his decision. So I said to him “That happens to be a classic blues album.” I forget what else I said to him but it didn’t appear that I was making an impression on him. So the next statement that I offered him was a bold one. I told him that “if you buy this album and you don’t like it, I will buy it back from you.” Thinking that would convince him to purchase it. That’s how confident I am of its contents. Instead, he put it down and walked away. His loss!